Five graduate students have received funding for research projects that will explore current water resources and coastal issues in North Carolina. Their fellowships are supported by North Carolina Sea Grant and the Water Resources Research Institute of the University of North Carolina system. The competitive funding opportunity is open to graduate students across the state. For 2016, student recipients are from Duke University, East Carolina University, North Carolina State University and the University of North Carolina at Chapel Hill. “Combining the research interests of WRRI and Sea Grant made for a very unique funding opportunity that is applicable to a wide and diverse group of students,” notes John Fear, Sea Grant and WRRI deputy director. Regina Bledsoe, a doctoral student in ECU’s interdisciplinary doctoral program in biological sciences, will study a newly constructed stormwater wetland on the university’s campus. 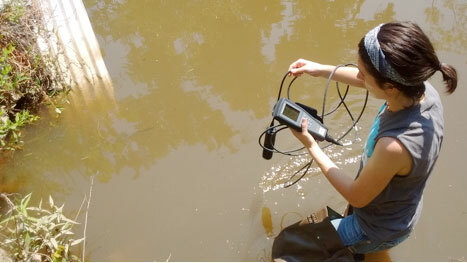 The research builds off of previous work in restored wetlands by advisor Ariane Peralta of ECU. By conducting the project in an urban setting, Bledsoe will address gaps in previous research and determine management strategies for enhancing wetland function, improving urban water quality and decreasing greenhouse-gas production. Elizabeth Christenson is a doctoral student in applied microbiology at UNC-Chapel Hill’s Gillings School of Public Health. Her advisor is Jill Stewart of UNC-Chapel Hill. Christenson will study the prevalence of antibiotic-resistant, virulent E. coli in North Carolina’s agricultural watersheds. The project includes using a recently developed technique, known as microbial source tracking, to determine the host source of E. coli present. She also will incorporate spatial analysis to identify land-use characteristics that may mitigate effects of contaminated runoff. Jack Kurki-Fox, a doctoral student in biological and agricultural engineering at NC State, will test an innovative model of nutrient removal for restored wetlands. Using a lab-scale model of nutrient removal — previously developed by advisor Michael Burchell of NC State and department members as a jointly-funded Sea Grant and WRRI project — Kurki-Fox aims to demonstrate water-quality and ecosystem benefits at a field scale using a large restored wetland in Hyde County. Casey Lindberg is a doctoral student in Duke’s integrated toxicology and environmental health program, part of the Nicholas School of the Environment. Her advisor is Richard Di Giulio of Duke. Lindberg will study the impacts of multiple environmental stressors, including hypoxia and common chemical pollutants, on fish populations native to estuaries along the East Coast. She will use wild-caught populations of Atlantic killifish, a small, nonmigratory estuarine fish known to have evolved resistance to certain water contaminants. James Peerless, a doctoral student in materials science and engineering at NC State, will study a novel technology to filter and desalinate brackish groundwater. His advisor is Yaroslava Yingling of NC State. The design involves combining common activated carbon with innovative nanotechnology research. Using computer simulations, Peerless will design and optimize the model to predict purification effectiveness before moving to fabrication. Learn more about the graduate students and their projects in this blog post. More information about this and other funding opportunities is available at ncseagrant.ncsu.edu/funding-opps/.